When you think of heavy duty fans for air circulation, the first thing that comes to your mind is a high-velocity fan that helps cool your space just like an air conditioner. A high-velocity fan is an ideal option for drying, cooling and venting out garages and workshops. These high volume fans are quiet loud and are also used as white noise equipment to block other frustrating noise while giving amazing air circulation. 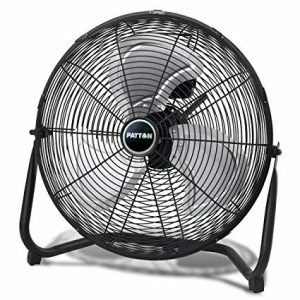 Many users opt for a high-velocity fan in their huge workshop in place of air conditioners to provide better air circulation as well as to use it as a noise blocking fan. 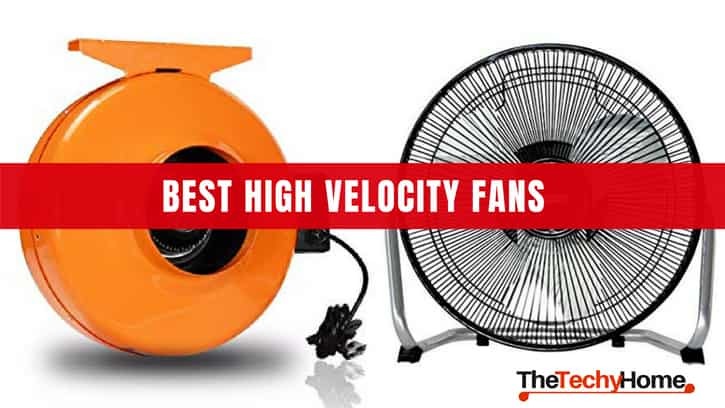 If you are planning to buy a high-velocity fan then learn about the best selling fans that are trending in the market today. Let us review some of the best selling fans and dive into their features. This is an amazing 35” Space saving high velocity fan that comes with remote control. You can see a small footprint that has a power equivalent to that of a floor fan of 20 inches. The fan has a sleek design which doesn’t occupy much of your space. The oscillation is optional and can be used to get air circulation within a wide area with directional louvers that help circulate the air wherever you want. 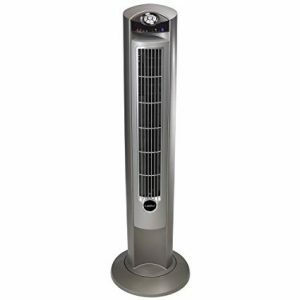 The multi functional remote along with on-board storage and electronic timer with auto-shut mechanism is included with this fan. This high volume fan is powerful and portable which make it easy for you to carry it wherever you go. The model is a perfect choice for basements, home gyms, garages, laundry rooms as well as kitchens. This high velocity blower fan is an amazing high power fan for ventilating, drying, cooling and exhausting. The fan comes fully assembled and in ready to use condition. 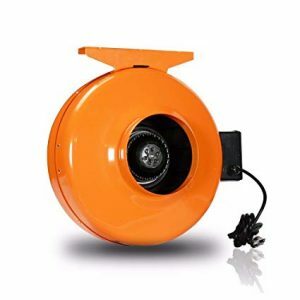 This blower fan is a powerful fan that offers high-velocity air circulation for both indoor and outdoor use. The plastic housing is highly durable and gives you long lasting air circulation. You can carry it easily anywhere you go with the help of its sturdy handle. Circuit breaker comes with reset button for additional convenience. You can use it immediately as it comes assembled. Rotating head blasts of the blower distributes air wherever needed. Ideal for small spaces to circulate fresh air like basements, garages, attics, work spaces etc. This high velocity fan helps regulate air circulation at your work place, home etc. It comes with metal construction that is highly durable and ideal for workshops, garages etc for drying, ventilating and cooling. You can increase the air circulation, air intake or air exhaust with the help of speed settings up to 3 levels along with tilted and adjustable head. The metal of 20 inch circulates the air perfectly. Tilt and adjustable head promotes air movement effectively. 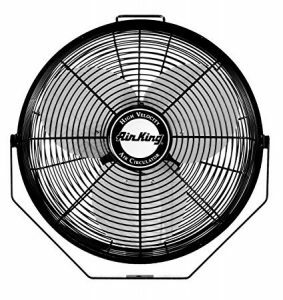 If you are hunting for a heavy-duty, powerful high velocity fan, then look for Air King Fan. The best thing that many people like about this fan is its wall mount feature. It can also be mounted on steel beam or ceiling to fit into small space and prevent tripping on the power cord. The motor is quiet during operation. It comes with 3 speed settings for rotations of 1500 per minute and CMF up till 3190. It has spinning head with pull cord mounted at the back end. The fan also includes guard for the steel blade along with a 9 foot three conductor power cable. The fan is ideal for industrial use. There might be little noise heard at times but that is quite low for the type of air circulation offered by this heavy duty industrial fan. The noise is bearable. This industrial heavy duty blower fan is quiet, operates smoothly, and you can also utilize the bracket in the form of a stand in case you want to place it on the floor. The motor is quite powerful and is quiet and won’t let you feel noisy. The high velocity fan helps control temperature as well as odor in grow area. The Growbright 6 high velocity inline fan are the best fans for air cooling, carbon filters, lighting reflectors or to attach to the duct to promote ventilation to your grow area. Growers can easily eliminate odors and let the equipment remain cool using this compact and effective metal fan. It is very easy to use and install. The 110 watt and 6 inch fan has the power to push 424 cubic/minute. You may find it challenging to keep your house cool but it is no more a challenge with Mainstays 9″ High-Velocity Fan. The fan has a rotary switch that comes with 3 speed settings to offer better regulation of air circulation. If you need a gentle breeze, you can turn it to low speed and in case you want to cool your room quickly you can put it on high speed. The fan is constructed using sturdy metal and it can adjust vertically without any hassles to function better. You do not need to assemble this fan as it comes fully assembled. The 180 rotating feature bends the fan to help you direct the air circulation in any direction you wish to. The fan comes with warranty of 1 year. 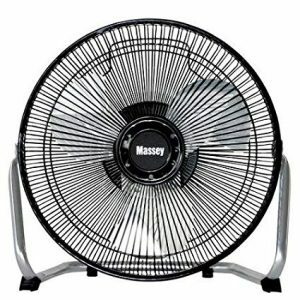 You can experience cool breeze in hot summers with Mainstays high velocity fan. When spring approaches you just have no idea how much hot spell you are going to experience and thus best high velocity floor fans are like life saving machines for you. The high velocity floor fans help keep your home cool all through the hot summers. The fans distribute the air evenly and efficiently throughout your house. It is easy to decide to buy a floor fan, but on the other hand choosing the right one can be a difficult task. There are some factors you can consider to buy the right floor fans to beat the summer heat. Of course the size of the floor fan is crucial and also the speed of the floor fan. It is yet another incredible 3-speed high velocity floor fan that will offer perfect air circulation in your house, garage or workshop. It is a sturdy, powerful and offers high quality service to suit all environments. 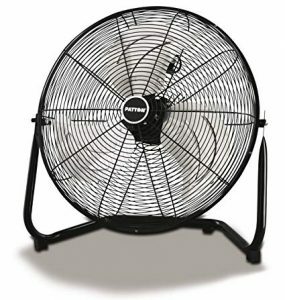 The fan is built using sturdy metal and it is one of the high velocity floor fans that has 3-speed settings with metal blade of 18 inches in size, which is specially designed to promote enhanced air flow. The powerful motor moves the blade efficiently with the help of 3-speed setting to enable maximum air circulation. The head is tilted and adjustable so that you can adjust the air circulation as per your needs. The fan comes with powder laminated finish and looks stylish to suit your workshop, home or office. A carry handle enclosed offers portability and comes along with warranty of 3 years. There is nothing much to do with assembling part. You can’t rate this high velocity floor fan among the silent fans in the market. Ideally, it is designed to suit the needs of workshops where high volume of air is required. The fan is energy efficient with 3 speed settings as it utilizes power as required. Indeed a fantastic fan to suit your garage or workshop. The 18 inches large blades circulate high volume of air to provide cooling as well as ventilation. It is also a good choice to dry furniture, carpets or almost everything. The tilted and adjustable head helps distribute the air efficiently and wherever you require. Lasko offers most elegant, stylish and sophisticated floor fans. Each of the fans comprise of a plenty of features that helps cool your space and also scatters fresh aroma of outdoors. It is one of the fantastic indoor floor fan that will suit any home décor. It features a fresh air ionizer which is CARB adaptable. This floor fan is engineered to give out negative ions and let the fresh smell from outdoors enter your house. The fan is quite stylish and gives you the relief from scorching heat in summers. It is one of the incredible and stylish fans for living rooms as it adds to the comfort as well as the décor of your room. The height of this floor fan is 42.5 inches and it is distributes the air evenly throughout the room. 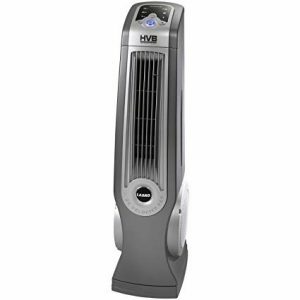 With the 3 speed setting this fan is an ideal choice for your office or home. It comes with a remote control for easy operations. You will get a safety plug and a carry handle along with this fan. You don’t have to assemble the fan as it is already assembled. The fan operates quietly. It comes with timer that is energy saving so that the fan doesn’t operate non-stop. The fan automatically turns off after non-stop use of 7.5 hours. It is indeed a tall, stylish and energy efficient fan that is most stylish and reliable among all other products. It helps keep your rooms cool and lets the fresh smell of outdoors enter your room. It offers oscillation for wider area and it a perfect fan to move air evenly all throughout your room. 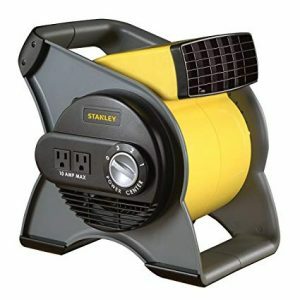 It is one of the powerful high velocity floor fan for your workspace or home. The fan can operate as a table fan or can be mounted on the wall to save space. 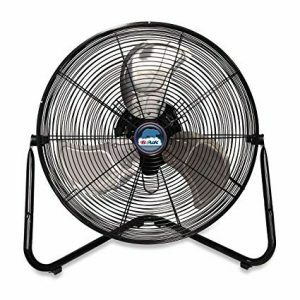 It is one of the preferred floor fans among the other fans in the market. Indeed the powerful floor fans that comes with Aerodynamic Turbo design. The design helps the fan to circulate high volume of air throughout your office or home and offer maximum cooling. You can easily remove the grille of this fan to clean the fan and you can either wall mount the fan or place it over a table. There are 7 blades attached to the head of the fan and the head can bend to almost 90 degrees. There are 3 speed settings to offer better control. The fan is fully assembled and you do not have to use any tools to assemble it. You can remove the grid easily for maintenance and cleaning. This a super cool fan that operates quietly. It produces 25% less sound than the other products in competition. It is energy efficient air circulator as its design itself is made to help you save on your energy bills. You can use it with the air conditioner to circulate the airflow efficiently. A fan designed especially for office or home cooling is surely going to help you experience the cooling effect all throughout the summers. It is powerful, efficient yet quiet and it can be on your list of best fans that you can mount or place it over the table. Using it along with your air conditioner can help you get extremely cool air in your shop, home or office and also help you cut down the costs on your energy bills. It is one of the most preferred high velocity floor fans. It will efficiently cool a huge space like living room, workshop, office etc. Any large space can be cooled easily and effectively. The fan comes with 3 speed settings and is easily adjustable and can be bend up to 360 degrees. So, this makes it easy for you to cool down the space or area you need. It is one of the highly durable and powerful with sturdy metal construction on the back and front grill of the device. It is UL certified and complete safety is guaranteed. The product has a warranty of 1 year. Large sized blades of 20 inch. You may find the product difficult to clean. 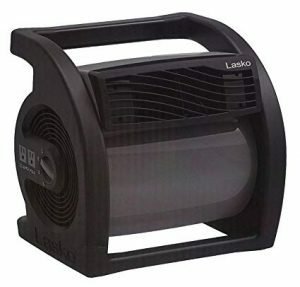 Lasko certainly tops the list of floor fan among other products in competition. 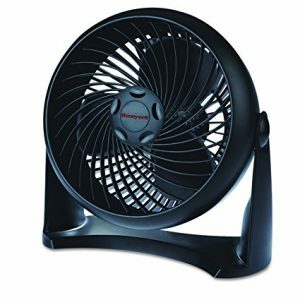 It is a brand name for best floor fans that include sturdy and powerful fans with a set of features to unleash. You can use these fans to meet your cooling and ventilation needs for office or home. With a robust and sturdy design the rotating floor fan offers direct air flow that cools, ventilates your space and you can used it to dry a lot of things. It comes with a three projection grounded plug plus a 120 volt outlets especially for accessories. You will get complete safety with this product as it offers safety plugs and is also listed under ETL. A sturdy carry handle helps you place this fan anywhere you need and move it if required. You don’t have to use any tools to assemble this fan as it is already assembled for you and you just need to plug it and start using. It may not be as silent as other floor fans you come across but it fulfils its main purpose which is to provide excellent cooling for your space effectively without aircon. You can consider this fan while shopping for the best floor fans for indoors that will fill your house with cool breeze and help you fight the summer heat. You can move the fan anywhere you want to. When it comes to selecting a floor fan you need to make sure it is a high velocity fan as it offers high speed and higher air circulation which cools your room efficiently. Choosing a floor fan will be a smart decision as it is energy saver, reasonable and offers excellent cooling to workspace or home. When you have a floor fan you don’t need to use an air conditioner. It is easy to use the floor plans as you don’t have to learn to install them. Of course you need to consider certain factors while shopping around for a floor fan. Out of the many factors safety comes first and if you have kids around then safety is the prime factor that shouldn’t be overlooked. Floor fans can come with large sized grills as compared to the desk fans and if you have kids at home it might become easier for them to put fingers inside the grills and they may end up getting hurt. So, make sure you decide a place where you will install your floor standing fan. Some of the fans offer safety features like fused safety plugs. In case you want to buy a floor fan for the bedroom then you need to consider a fan that makes less noise. You can think about buying a fan that comes with different setting to regulate speed so that you can switch to a lower speed setting that doesn’t yield noise. It is easy to move your floor plans and you can simply place them anywhere you want to get better air circulation. The oscillating fans provide better air flow for a large area. You can maximise the circulation of air by bending the head of the fan to get increased air flow throughout the room. Make sure you check the reviews for each fan before you decide to buy one. You can go through customer reviews to know their experience using the product. Also, determine your cooling needs and whether you have an air conditioner already. It also depends on your location and the intensity of summer heat that helps you buy the right floor fan. If you have kids make sure decide the safe place to install where your kids cannot reach the fan. Do not just go for the style and looks instead go for the features.